Sea Salt Nuts..."Nuts for you!" - Sea Salt Nuts are quite simply the best extra large gourmet Virginia peanuts cooked in fresh peanut oil & dusted with sea salt crystals. Enjoy the crunchiness with just enough sea salt to satisfy your cravings. All natural sea salt nuts. Enjoy Sea Salt Nuts with Blue Crab Bay Co. Spicy Bloody Mary Mix! 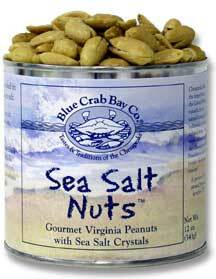 Blue Crab Bay Co. Sea Salt Nuts.